Three old friends and one newbie try to revive a vacation tradition, with mixed results. 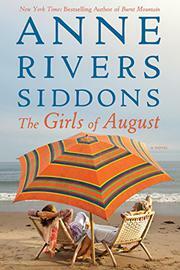 The self-styled Girls of August are an intrepid band of doctors’ wives who have gotten together for annual summer sprees ever since Cornelia—the rich, blonde consort of party-animal physician Teddy—invited them to share her beach retreat. None of the other “girls”—Rachel, Barbara and narrator Maddy—actually liked Cornelia, but no matter; Teddy soon replaced her with the more copacetic Melinda. For the past three years, ever since Melinda’s tragic accidental death—Teddy was drunk at the wheel—the girls have stayed home, but then this summer, Baby, Teddy’s 20-something third wife, entices them to familiar Siddons territory, the South Carolina barrier islands. Baby’s opulent home is located on the deserted and fictional Tiger Island, virtually unpopulated except for a resident enclave of Gullah people. Gloriously incommunicado (the only cellphone having met its demise), the women drink, cook delicious meals and swim. But problems soon surface: Maddy suffers from intermittent nausea, Rachel almost drowns, and Barbara seems to be sliding into serious alcoholism. Baby is the source of much humor and rue among the 40-ish women: Not only is she blonde and independently wealthy like her predecessor, Cornelia, she enjoys flaunting her nubile figure by skinny-dipping. Perhaps to escape all the perimenopausal sarcasm, Baby disappears for long stretches. Is she having an affair with handsome Gullah fisherman Earl or merely plotting revenge? Someone removes the screen from Barbara’s window, letting in stinging bugs, and Maddy’s bed collapses one night. Has it all devolved into the middle-aged Southern version of summer camp farce? Nothing unpredictable or challenging can survive the many clichés—the wise and vaguely mystical Gullahs, the stereotypically airheaded trophy wife and the other characters who somehow lack the mettle of Steel Magnolias but who might qualify as copper or tin. A slight bagatelle in which even the weightiest topics are sloughed off like suntan lotion in a tropical rainstorm.